Within moments the pain in my ankle had become unbearable and I was beginning to feel weak. “Eurydice has been bitten by a snake,” I could hear someone call out. A chill passed through my heart. I was dying! No one survived snake bites. The fates had cruelly snatched away all my dreams. The last I could remember was the soulful face of Orpheus, his eyes gazing at me filled with love and concern as my vision faded away into nothingness. I heard the tinkle of anklets and the rustle of gown close to me. I gingerly opened my eyes. I was in a dark chamber. As my eyes got used to seeing in the dim candle light, I noticed a woman of unparalleled beauty standing next to the bed looking keenly at my face. Who was she? I had never seen her before. “Where am I?” I asked weakly. She just smiled reassuringly in response and gently ran her fingers through my hair. “Where is Orpheus? Is he also here?” I asked anxiously. “You are still tired from your journey, my dear. Once you are fully recovered all your questions will be answered.” So saying she slowly rose and departed from the room. Slowly sleep overtook my anxiety and all my questions dissolved in the tranquility of peaceful slumber. When I came to again, it was still dark. But the strange lady was not with me anymore. I looked around and found the room to be quite spacious. Some tapestries hung on the wall portraying scenes from the Titan wars. I gingerly got up and stepped out of the room. “Ah, so you are up. Let me take you to Lady Persephone.” A chubby maid with a gentle face stood in front of me. I followed her and she took me to a grand room that would have suited an empress. I did not have to wait long to be ushered into the presence of Lady Persephone. It was the same lady who had been by bed side earlier on. “You are no longer alive. You are in the world of the dead.” She had a dead pan expression on her face. I was not sure if I had heard right. But then it explained lot of things. She must be right. I would never see Orpheus again. Tears welled and flooded my eyes. She came closer and put her arms around me. Over the next couple of months, I realized death was not as bad as it was hyped out to be. It possibly was for those sent to fields of Asphodel or the dark pits of Tartarus. But for me life was quite comfortable as one of the attendants of the queen of the underworld. But I still missed Orpheus terribly. Some part of me still believed he would come to me even here. But I knew that was not possible unless…. No. I was not so selfish. I could not wish his death. One fine day familiar strains of music wafted into my ears. My heart leapt with joy. Orpheus! But how was it possible? My feet involuntarily ran in the direction from where the notes were coming. They lead me to Persephone’s chamber. By now the music had taken on deeply melancholic shades and the notes were pulling at the depth of her heart. Nobody else but he could play music like that. I soon found myself right in front of Persephone and there he was right in front of her, his lyre in hand. His face looked so haggard and piteous. I ran up to him and flung myself into his arms. After what seemed like an eternity, I was disturbed by a gentle sobbing sound. I turned around. Persephone had risen from her seat. Tears were streaming from her eyes. “I will talk to my lord,” she said as she hurried away. The next day was the most exciting day of my life. The impossible had happened! The Lord of the underworld had consented to let me return with my Orpheus to the world of the living. I would be alive again and I could live all those old dreams! True love had triumphed. He had come all the way to be close with me and he would now take me back. However there was a small catch. He was to lead the way and I would have to follow behind. He was warned never to look behind if I was following till we both had emerged into the world of the living. The journey was quite uneventful and he entertained me throughout the journey with his joyous notes. After what seemed like days, finally we arrived at our destination. He stepped into the broad daylight and I followed close at his heels. As I was about to emerge into the daylight he turned around. Our eyes met for a moment and then suddenly I was whisked away and found myself back in Persephone’s chamber! Once again fates had cheated us. If he had but waited that extra moment to turn around or if I had been faster by a whisker ! But no! That was not to be! I was told he would never be able to find his way to the land of death ever again as long as he was alive. I resigned myself to my fate. The memory of those few brief moments of togetherness was the only balm to my sore heart. But, he was my Orpheus. He had come so far to be closer to me once. And he came again. Last time he had come to take me back. This time he came to stay with me forever, relinquishing his life in the world of the living. And we found the life that was denied us in the world of living in the world of the dead. Greek mythologies are always interesting.. nice one ! Ah! Good retelling from Eurydice's view point. 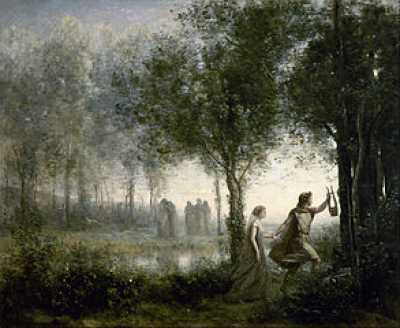 A variation is that Orpheus knew Eurydice was coming behind him by the tinkling of her anklets. Grit gets into it and they stop tinkling and he turns back to see if she was still following him. Thanks Suresh. Didn't know that variant - interesting. That was a marvelous retelling of the story of Orpheus and Eurydice, Karthik. Your style is as effective as Orpheus' music. I love how you flesh out the tale with your imagination. As I read on, I almost believed for a moment that you are going to change the end.